Looking to get the most out of your money? Learn how to find the best joint checking and savings accounts to build your wealth! One of the first things every couple should do is to make sure they have a bank or credit union they are happy with. Yeah, I said it – happy with. There is no reason why you two should be working hard to pay the bills and save to get ahead just to have your bank drain your accounts with fees and needless services. I know it can be hard to switch your bank, especially if you’ve used them for years. You worry about what could go wrong and you don’t want to deal with the hassle. Trust me, though, you want to make the switch now. We, unfortunately, had to find out the hard way before we made the switch. Pressed for time? Download Finding the Best Joint Checking Account for You (right below) and listen to it during your commute. You can also subscribe to the Couple Money Podcast for free so you can get the latest episodes sent right to you! 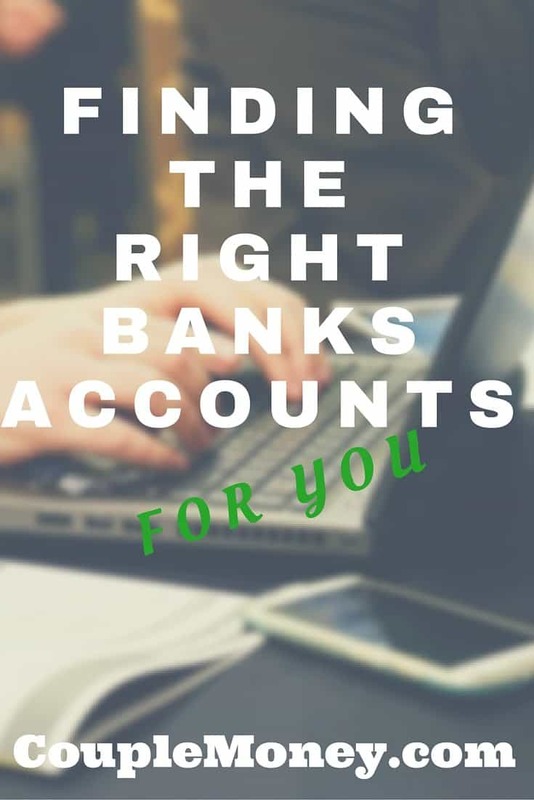 Which Bank is Best for Our Joint Accounts? When my husband and I first got married in 2006 we decided to open joint checking and savings accounts and keep most of our money there. We both had free checking with two of the big banks (Bank of America and Wachovia at the time) that we opened when were in college. Since they were student checking accounts they had no maintenance fees which was a plus. However, they didn’t offer much else so neither account stood out. Because I would be taking care of the day to day budget and bills, we opened our joint accounts with Bank of America. I never had a problem with them so I figured it would be alright to use them. Within 6 months of opening the joint accounts, we were having problems with them. Besides getting hit up with bank fees (now we had a monthly minimum to keep), wrong accounts being debited (bills came out of my account instead of the joint), and rude customer service (don’t even want to talk about that). We just weren’t happy to see our savings grow by pennies each quarter. Pennies! When you take into account the maintenance fees, we were losing money. We finally decided this was enough and we started looking at other options. We started by asking around with friends, family, coworkers, and other students to see if anyone recommended their bank. I was a bit surprised to see that most people weren’t that enthused about their own accounts. I did find a few for a local credit union that I already had a savings account with. The problem was that we wanted a bank or credit union with plenty of ATM access and at least a regional presence. We considered both national banks, regional banks, online banks, and local credit unions in our search. We also wanted a savings account that would earn more interest than what we were getting. We also were looking for a reputation of good customer service since Bank of America left a bad taste in our mouths. We definitely had a big wishlist for banking, but we figured if we found what we were looking for we could move the money there and not stress about switching for a while. After researching a bit, we finally decided to go and open an account with an online bank. It offered interest on both its checking and savings account and it had free online bill pay. It’s been a few years since we made the switch and we have been very happy with the level of service they have given. We love having no hassle options to choose from. Higher rates on savings means our money is working more for us. We’re curious to hear your take on banking. How do you feel about your bank or credit union’s service? What is the best bank out there right now? What’s the worst?